Lumpy: I think I'd better go home now. Lumpy: 'Cause I'm not supposed to go in that part of the woods. Scary things live there. Roo: Huh? That's where I live. There aren't any scary things there. Lumpy: Are too. There's a stripy thing that bounces and it goes hoo hoo hoo hoo! Roo: Whoa! No, no, that's Tigger. You're wrong about him. He's great. Lumpy: And there's this little pig monster that squeals and shrieks all the time. And it will get you if you don't watch out. Roo: You're wrong about Piglet too. He wouldn't hurt a fly. Lumpy: And then there's that loud thing. He's got long ears. And he yells at everybody. Roo: Yeah, you're kind of right about Rabbit. But he's okay, once you get to know him. Roo: You're not captured anymore. Winnie the Pooh: [narrating] You know, we never really did capture a heffalump that day. It was more like... like Lumpy captured all of us. Roo: H-hey everybody, look what I found! Tigger: [pointing] It's a swimming pool. Eeyore: The sky has finally fallen. Always knew it would. Roo: Are you sure you're a heffalump? Lumpy: My mummy says I am. Roo: Well, if you are a heffalump, then in the name of the Hundred Acre Wood, I capture you! Roo: I've gotta catch a heffalump. [pounces Roo] Lumpy: You can catch me. I'm a heffalump. 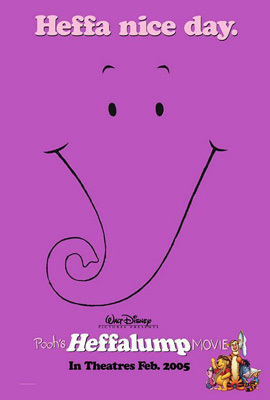 Lumpy: [hopping up and down, singsong] Heffalump. Heffalump. That's what I am all right. A heffalump. Rabbit: [silencing everybody] One at a time! Rabbit: Thank you. Now what is going...? Tigger: [interrupting] Oh, oh, me! Pick me! Me-me-me-me-me-me-me-me-me! Tigger: There I was, sleeping, dreaming Tiggerish dreams. Winnie the Pooh: [narrating] This is one of my favorite once-upon-a-times, although I'm not quite sure which time it was once upon. But it had been so nice and summery in the Hundred Acre Wood and the sunshine was as warm as a blanket. And the streams were gurgling happily. As - as happily as a tumbly full of honey, hoo, which is very happy. But all that changed when... the stranger came. Roo: 'Scuse me. What's a heffalump? Rabbit, Tigger: What's a heffalump? Rabbit: Everyone knows what a heffalump's like. Tigger: It's gotta fiery eyes and a tail on its spike. Winnie the Pooh: The heffalump ate my honey. Well actually, I did, but it made me do it.